The British developer behind the unusual game The Book Ritual calls it a BYOS—bring your own shredder. Alistair Aitcheson showed it to me last month in San Francisco at the Game Developers Conference, the first time he’s shown it in the U.S. I spoke with him and played it for about an hour. During that time we discussed his intent, inspirations and about the transformative power of art. I also shredded a book. At GDC, Aitcheson piled his demo table high with books. In the center was a small monitor with a DIY controller box. It had a giant red button in the middle to start, some arrows to scroll through options, a back button and a menu button. 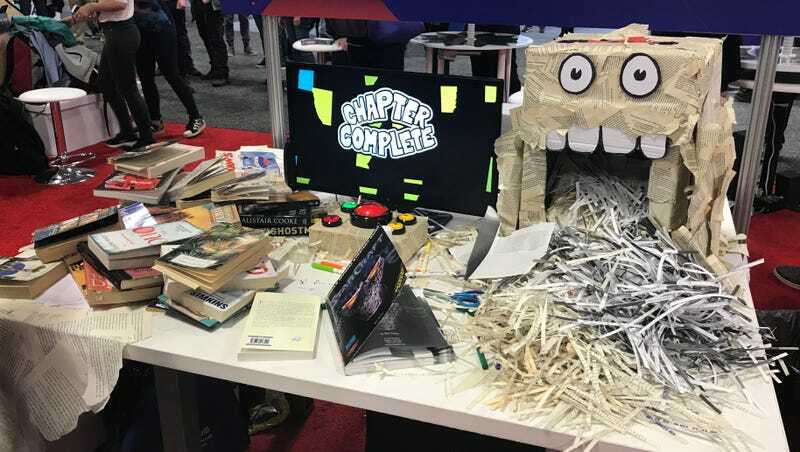 To the right of the table was the star of the demo—the paper shredder, lovingly covered with pasted book pages and adorned with a monster face that would seemingly spit out the shreds players create. Scattered about the table were novels, textbooks, poetry, and game guides; a delightfully geeky, and notably British, library ready to literally be torn to shreds. I’ve always run by the philosophy that you can tell a lot about a person by the books they read. When I was in undergrad, I owned the books of a dead woman. So many of them had flowers and leaves tucked between their pages. These were tiny pieces of her life quietly hidden to be seen again, or maybe not—similar to the way our brains keep memories of grief and loss stashed away in the far files of our minds to remain a haunting part of our identities. I love books, though in recent months, have fallen out of love with their physical mass. These days, I’m a die-hard Libby and e-book loyalist as I don’t live in a space where I can accommodate traditional books. So when I came across this game about shredding them, I don’t think I was as apprehensive as the typical person might be. I’ve already lost my connection to the physicality of books. They aren’t as important to me anymore. But because I don’t interact with physical books as often, they’ve become a luxury. To say my stomach didn’t churn a little would be a lie. Aitcheson told me he doesn’t just create video games for entertainment value, but rather to explore sides of himself and others who play. He made The Book Ritual in a time of his own grief and search for answers. As he told the story, he got so moved, as did I, that we both nearly cried. I didn’t ask him what the event or moment was that inspired him to tear up books he “didn’t get on with,” but, in the end, The Book Ritual was his way to transform his powerlessness into closure and relief. The Book Ritual works like this: the player chooses a book, writes the title, and picks a chapter from the game. The game then personifies the book and the shredder and takes the player through a series of activities: writing, shredding, creating a face for the book, circling certain resonant words, and the like. Through these activities, there are prompts, and it even has bits and pieces of its own storytelling. There is very little actual reading of the book, so it’s best played with one that isn’t loved. Throughout the process, the prompts will tell the player pick any page—whether it’s written on or not—and shred it. A page has to be torn out and shredded. The game will not progress otherwise. During the exhibition mode demo, I snatched Aitcheson’s copy of a John Keats anthology, and as if by fate, I bumbled right into the chapter of the game about the loss of love. Just like the actions it inspires, the game too appears pasted together. It has garish, contrasting primary colors, and bold, black and white text. I never got to know the woman whose books I owned while I was an undergrad. I never even knew her name. She was a family friend of my former fiancé’s grandmother, and when he and I cleaned out the woman’s house, I decided to house her copies of books on poetry and writing and fawned over her copy of The Great Gatsby from the 40s. I still breathe in its sweet, vanilla-scented pages. My fiancé took some of her Tom Clancy books and her copy of Mein Kampf, concealed in hot pink paper. I gave one of my journalism professors her well-loved grammar book from the 20s. While I was moving out of my dorm for the final time last year, I found the box I’d housed them in again. Because I was moving to California with only four bags, I made my peace with the majority and donated them to my local women’s shelter to find the love and care of, hopefully, another survivor out in the swamps of Fort Myers, Florida. I wouldn’t exactly call the last year and a half of my life a great one. Between hurricanes, saving my friend’s life, my own medical trauma, breaking off an engagement and making a coast-to-coast move, it was challenging. Thankfully, The Book Ritual gave me the agency I needed to release some of that hurt. During the writing portion of the chapter, I wrote about my—rather ugly—broken engagement. It’s still the part of the chaos that hurts the most. I got engaged when I was 21 and my partner was 25, which was the best and worst decision I’d ever made. We weren’t planning on getting married until we could afford it, but grad school would take me away from him for at least a year. I wanted commitment, and after having been together for about four years, we needed to make a decision. Shred. We picked out a ring together last Valentine’s. It wasn’t anything showstopping—we were broke college seniors—but I adored it all the same. Shred. Our engagement was the best decision because it gave me what I needed to feel confident about the future, and it was something I truly wanted. It was the worst decision because I gave up part of my identity for him. Shred. As I was writing this down as part of the game, a man stopped me to ask if he could take some photos for his daughter who loves blackout poetry. I told him of course and continued to write all over Keats’ stanzas. It’s a big ask to hope someone who loves you will uproot their life for you. I would have done it for him in a half a heartbeat, but I also had a lot less to lose than him. I came from a broken family and was used to a very nomadic lifestyle. He’d been in one place his entire life. Shred. To me, he was my family and my future, and grad school was the next step to creating our life together. He didn’t seem thrilled. “The plan” and I weren’t his. Shred. I must have torn out 20 pages, ones I wrote on and ones I did not, as The Book Ritual took me through its own story of a young person and the loss of their lover through their own trepidation. They fell in love. Shred. They painted together. Shred. They broke things off. Shred. In their process, they burned everything they’d created together. Shred. She came back into their life. Shred. She asked about their art. Shred. They told her the truth. Shred. They lost her again. Shred. This act of writing and cutting and pasting and shredding is similar to many techniques I’ve used in my recovery from my trauma over the years. Cognitive behavioral therapy is one method that has been helpful for me to understand myself, the way my brain developed with trauma in childhood and how it operates now, as an adult. But the most impactful method I’ve used, in terms of healing and growth, was art therapy. Art therapy invites that hurt to sit with you for a bit, to make it tangible and real. It has you make something you can really look at and see instead of just fear from within yourself. Anxiety and grief and loss become totally different beasts when we can make them beautiful or conceptual. The Book Ritual is similar in that it invites the same feelings into the present, and delights the inner rebel, the one who knows they shouldn’t desecrate this beautiful thing that someone once poured their heart and soul into. It felt good to litter those pages and pages and pages with color and life and pain, to physically show myself how hard it was to lose my fiancé. That deliberate choice: to shred or not to shred, to hold on, let go, or pass on that grief (or hope) to someone else makes The Book Ritual so memorable. It makes its transformation of grief collaborative when playing it in a setting like GDC. Playing the game was emotionally draining, but also left me refreshed and filled with hope. Just like the flowers pressed inside the books from the woman I never knew, I left a few pieces of me for someone else to find. I don’t know if my pain can be treasured quite like flowers can, however. To the person who may have, or will shred those pages I left someday, I hope we can let go of our heartache together.